It's the weekend! wooo hooo! I needed a 'Thinking of You' type card for my uncle who is very ill. In his younger days, he used to love to hunt. 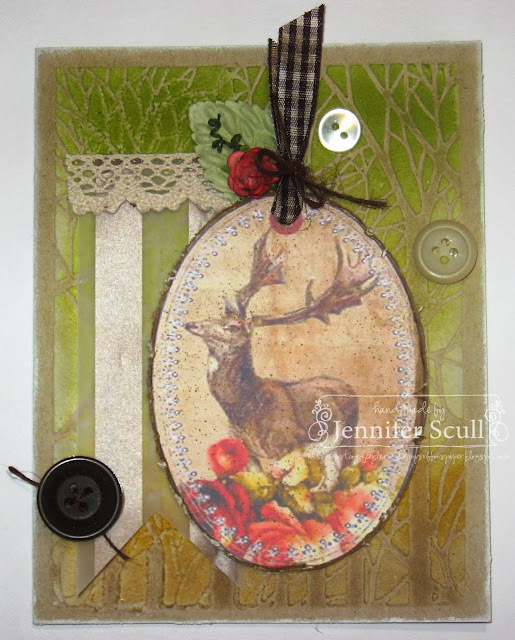 I was so excited when I found a wonderful page of Woodland Deer Tags over at Polly's Paper Studio. You might remember that this store was a sponsor of our last challenge here at Really Reasonable Ribbon, but Ginny, the owner, is also on the Design Team! :) It was so easy to add one of these images to a card for my uncle. The tag itself is tied with dark brown plaid ribbon that I lightly inked to give it an aged feel. A little snippet of brown burlap string ties the bow and is used on the big vintage button, too. A piece of crochet trim tops the vellum stripe banner. The pretty flower is one of the new coral open roses in the store. I added a few touches of ink to have it match the flowers on the tag. More detailed information about the card can be found on my blog, "Just Coffee Please..."
Beautiful card. Hard for me to make a masculine card and this one is perfect for many hunters. thank you, Nancy. you always leave such nice, encouraging comments!